HTML Tables used to be employed to create entire website layouts. Now, they should only be used in selective cases when appropriate. 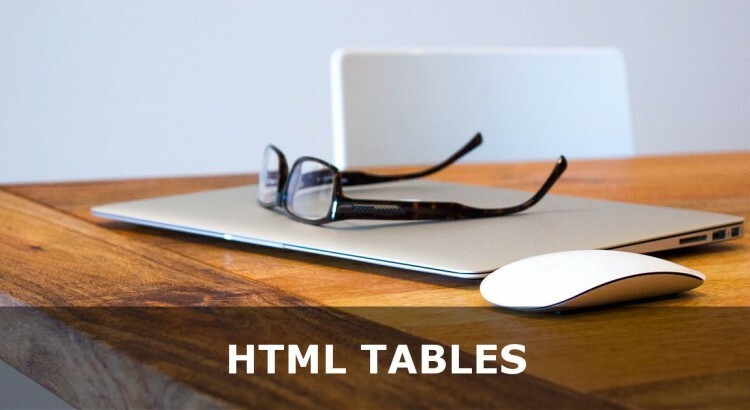 This HTML5 Tutorial will explain how to create a HTML Table and then explain how you should use it in the modern era of web design. Before we delve into this, it is really important that, as a habit, you open and close each tag pair when creating your table. If you don’t do this your table cells and rows could easily get messed up! width: you can set the width in pixels by using a fixed number (so a value of ‘400’ would set your table to be 400 pixels wide), or as a percentage of the available space. border: this sets the width (thickness) of the border both around your table and also between your table’s cells. bordercolor: if you’re from the UK, notice the spelling of color – not colour. This sets the actual colour (in either hexadecimal, or select anglicised words – e.g. “red”). The colour I have chosen is #cccccc which is a ‘mid-grey’. cellpadding: this is the amount of space between the edge of the cell and the stuff inside a cell. cellspacing: this is the amount of space between cells. Each row of your table needs to be marked up using <tr> </tr> tag pairs. For now, it is best if you space out your code similar to above, so that you can see each table row clearly. There aren’t really any attributes of the <tr> though we’ll look at some neat tricks you can do in CSS3 for Tables at a later point. If your table has ‘header’ information – like the top row label in an Excel Spreadsheet – then it can be helpful to mark these as <th> tags. Often browsers will automatically centre-align the text in the cell and make it bold. You can adjust this behaviour in CSS but for the purposes of this tutorial, we’ll leave it in place. Each header cell must have a corresponding </th> tag so that you are clearly telling your page what content is to be contained inside that particular cell. All other cells which are not headers are called table-data cells and are contained in the <td> </td> tag pair. These have no default behaviour, unlike your table headers. When building your table you must make sure you have the same number of cells in each row. That’s why spacing out your code as above can be really helpful – you can count there are 5 headers in the first row and 5 normal cells in the second row. Notice you can have a ‘blank cell’, which I have done above to ensure the top left cell is empty, while maintaining the equal number of cells in each row. Say you want to have a title for your table, you may want to have a row which takes up the full width of your table. This can be achieved using the colspan (Column-span) attribute of either a <th> or a <td>. As there are 6 cells in each row and I wanted my table title to stretch across the whole table, I set <th colspan="6">. Because this one cell has filled 6 cell spaces you only need the one <th> in this case. In this case, to ensure you are covering my 6-cell-width rows, you need to count the cells containing colspan (3) and the individual <td> </td> (3) – so I still have 6 cells represented in my row. So you can see that the cell with ‘July’ written in now covers all three rows of information – the header and the two weeks. Your rowspan starts from the first row you define it in and works down from there, until there are no more rows. So if you were to set rowspan="10" here, it would stop at the third. You will see from the example above that using rowspan has caused a layout issue. The intended activities for the days in question are no longer allocated to the correct day of the week, meaning I could be early or late for a meeting or conference – not good. There are two ways of thinking about text alignment inside your cells. There is the ‘horizontal’ alignment (where your text sits from left-to-right) and the vertical alignment (where it sits from top to bottom). align: to set the left-to-right alignment you need to just use the align attribute: <td align="center">. Accepted values are: left, right and center (again for my UK counterparts, center not centre. valign: to set the top-to-bottom alignment you need to use the valign attribute: <td valign="top">. Commonly acceptable values are: top, middle (not ‘center’) and bottom. In HTML5 tables are not really that different from HTML4. The only thing to bear in mind is that mobile has been growing rapidly in recent years and although you can Use HTML Tables for Page Layout, you really shouldn’t. See that tutorial for the explanation! In the next tutorial we will create a layout from a table, so you can make a whole website from that layout. We’ll also cover the downsides of doing this in modern web design. Tables are great for information which should be in tables – structured information as in this example and data are two good examples. Go ahead now and create yourself a table and if you have any issues, feel free to post them in the comments!